Last summer, artists across Europe were shocked at a proposal to ban the sale of artists’ paints containing cadmium pigments. This post is the first in a series in which I give my personal view of where we are now, and where we need to go in the future. Cadmium pigments are unusual in many respects, not least in their discovery. Cadmium was discovered in 1817 by Friedrich Stromeyer and Karl Hermann, in Germany, and only the following year Stromeyer was recommending the use of cadmium sulphide as a pigment. However it was not until the 1840s that commercial production started, and the initial high cost of the pigment resulted in slow adoption. According to Fiedler and Bayard’s authoritative account (in Artists’ Pigments. A Handbook of Their History and Characteristics, vol 1, ed. RL Feller, Archetype, 1986), it was not until the 1870s and 1880s that many artists started to use paints containing cadmium pigments, and even then their use was limited because of their high cost. 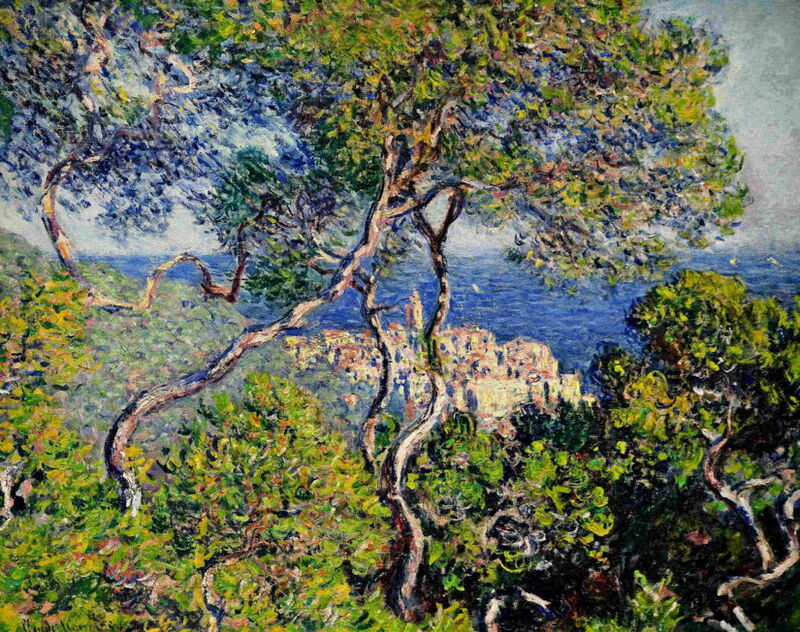 Claude Monet, “Bordighera”, 1884, oil on canvas, 65 x 80.8 cm, The Art Institute of Chicago (WikiArt). Yellows used here are based on cadmium pigments. Claude Monet began using cadmium yellows when he achieved commercial success in the 1880s, but other Impressionists and contemporaries were often unable to justify the cost. 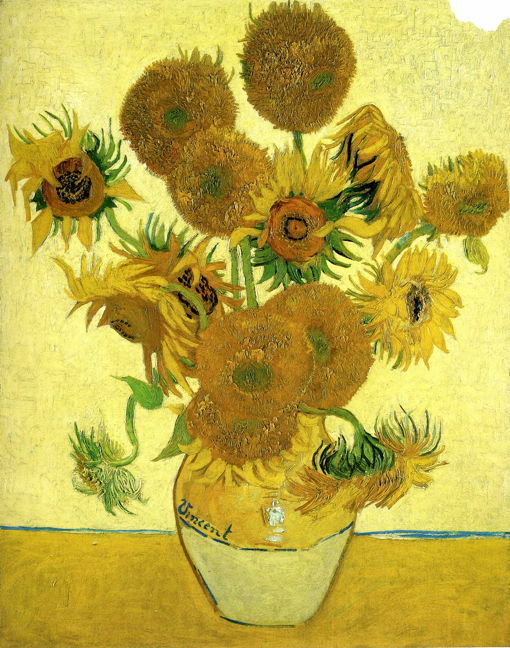 Urban myth claims that Vincent van Gogh’s famous paintings of sunflowers used cadmium yellows, but careful analysis shows that in those works at least, the main yellow pigment used was chrome yellow. If this comes as a surprise to you, further details are given in the definitive account Van Gogh’s Studio Practice, edited by M Vellekoop and others, Van Gogh Museum and Yale UP, 2013, particularly Chapter 14 by M Geldof et al. I can also provide references to individual research papers on request. Vincent van Gogh, “Still Life, Vase with Fifteen Sunflowers” (“Sunflowers”), 1888, oil on canvas, 92.1 x 73 cm, The National Gallery, London (WikiArt). Yellows user here are based on chrome yellow, not cadmium. Many painters today consider paints containing cadmium pigments to be uniquely rich in colour which is extremely lightfast, thus they have become an essential part of the palette of painters across the world. Although paint manufacturers offer a range of substitutes – distinguished by the use of the word ‘hue’ in their name, which is the manufacturer admitting for once that what is in the tube is not quite what the label might suggest – those substitutes are not as rich in colour, not as lightfast, and in other respects far inferior. Cadmium sulphide is, of course, toxic to man, animals, and our environment. However when used in artists’ paints, it is locked away in insoluble pigment particles. These particles are much harder to absorb any cadmium salts from, and do not release toxic salts readily into the environment. The proposal to ban the manufacture and sale of artists’ paints containing cadmium pigments was detailed by the European Chemicals Agency, ECHA, who are responsible for such matters within Europe, and you can download the full documentation from their site. The case in favour of a ban was put by Sweden, as a result of claims that pigments were being discharged in wastewater, which then became concentrated in sewage sludge, which was put on agricultural land, found its way into crops, and thus increased the dietary intake of cadmium, which resulted in increased risks of osteoporosis (brittle bones) and consequent fractures, and of breast cancer. However this proposal lacked some crucial evidence, and even if the ban had been put in place and been fully effective, it would have taken 100 to 150 years before there would have been a tiny reduction in the incidence of osteoporotic bone fractures and breast cancer across the whole of Europe. Indeed, the predicted reductions would have been so small even after that long period that they would have been undetectable. You can read the arguments that I put against the proposed ban in my PDF submission CdArtistsCommentsOakleyUK. Thanks to a publicity campaign by Michael Craine, of Spectrum Paints, Artists and Illustrators magazine, the art material suppliers Jackson’s, and others, over 600 painters made comments to the proposal, overwhelmingly for rejection. This made a great impact on the experts who were weighing up comments, as they had assumed that there would be little response or resistance. If you were one of those who registered their comment, I thank you for making a significant impact. The industry response was led by the International Cadmium Association, in conjunction with CEPE, the European Council of the Paint, Printing Ink and Artists’ Colours Industry. They presented a large amount of expert evidence which seriously weakened support for a ban. We do have friends overseas, and I would like to extend special appreciation to Golden Artist Colors, who carried out a survey of users, and submitted the results of that and comments, even though Europe is a small part of their market. What I found more surprising was the lack of response from certain key sectors. For example, across the whole of Europe, only one art school (the Royal College of Art, London) registered any comment, and none of the institutions apparently representing painters or artists more generally registered a comment – not the Royal Academy of Arts, nor any of the watercolour or oil painting bodies in the UK, or in any other European country. The result for now is a proposal not to proceed any further for the time being with a ban, and we are optimistic that should stop anything worrying from happening, for now. Several facts became clear during the consultation process, though. All the painters and other artists that I know are very ‘green’, and concerned with our environment. But very few realise how painting practices can damage the environment. It is so easy to give your brushes a quick rinse under the tap, and few even think what they are washing down into waste water, and what might happen in wastewater treatment plants as a result. If we as a sector in society do not improve our ways, then there will be further proposals to limit the substances which we can use in our painting. Next time it might be nickel, cobalt, or another substance, and sooner or later cadmium will be back on the agenda. Furthermore, as long as we do not have a unified and effective voice, we will always be seen as a soft option, which will be easy to implement, and lose politicians few votes. You and I know that more than 80% of world cadmium production goes into batteries, and that a pitifully small proportion of those batteries end up being properly recycled – most end up in landfill. Yet all the studies of water draining from landfill show that its cadmium levels are very low, at present. You and I also know that most of the cadmium that is put on the land is put there by the farmer, in poorly-processed fertilisers. You may not though be aware that in many affluent Europeans’ diets, a large proportion of their daily cadmium intake comes in chocolate, not vegetables. But targeting cadmium batteries, fertilisers, or chocolate would cause pain, grief, and loss of votes. You and I know that we were very nearly an easy target: a quick, clean, and painless success story for environmental politics, even though the benefits would have been immeasurably tiny at best. My next posting in this series will consider what we need to do to show that we are taking the cadmium problem seriously, and that we are doing something effective to protect our environment. Posted in Painting and tagged artists paints, ban, cadmium, environment, EU, Monet, pigments, van Gogh. Bookmark the permalink. I think it´s a good sign that something good is being done for the environment here and that there is now more control over this and related substances. Since the EU has collapsed it´s cadmium proposals came too late however. I personally avoid the use of cadmium colors as I consider them too bright for my taste…. As for the cadmium proposals themselves – banning cadmium altogether is indeed ridiculous and one of the myriad of examples which caused the EU to eventually collapse. It will take several years before EU officials do admit that the EU can´t be run on it´s present course. If countries like Greece however choose to leave EU – we should see the possibility of cadmium being produced in those countries. I think that rumours about the collapse of the EU are a tad premature! In fairness these proposals did not come from Brussels or Strasbourg, but from Stockholm. The background is complex, but has a lot to do with Green politics, of course, and easy targets.